Conventional wisdom states that cluttered workspaces lead to a disorganized mind. Mess prevents productivity and begins to hamper professionalism. Shouldn’t that apply to the computer desktop too? The simplest way to clean and organize your digital desktop is to add more space. Just adding a second screen doubles the available room and makes organization a breeze. Getting work done with a single-monitor setup is a balance of poor compromises. There never seems to be enough space and the little space available is full of clutter and mess. Switching between windows or tabs wastes time and distracts from work to be done. Stacking windows together, side-by-side, or top and bottom wastes valuable screen real estate. The resulting clutter of windows makes it hard to focus on what is important. While most tasks can be tackled feasibly with a single monitor; two makes the same tasks faster, simpler, and much more enjoyable. Data entry with two monitors is far easier than data entry with one. Having source data on one screen, laid out in large type, and the destination on another makes the job a breeze. By eliminating the need to scroll tiny windows or switch tabs, forget and repeat; the same job can be done in a fraction of the time. Graphic design, image manipulation, and editing are key areas that make the most of a dual screen setup. Stacking one image on each screen allows you to make quick comparisons to make sure your work is going in the right direction. Organizing your editing space is made simple too. Stacking your tools, menus, and options on one monitor with your image maximized on the other helps to stay focused and finish the task. Having more than a single screen helps you to track tasks you need to keep on the back burner. A team chat window to keep on top of collaboration, status updates for business-critical services, or the latest stock price. These windows and dialogues can remain open and serving updates on a secondary screen while you keep your work focused on your first. It is not uncommon for stock traders or financial analysts to maintain 6 or more screens running from a single computer. Many uses this to track various stocks or indices so they don’t miss a beat. Multiple monitors can be arranged in almost any practical configuration imaginable. While traditionally positioned in landscape orientation, second, third, or fourth monitors are often rotated 90 degrees to portrait orientation. This setup is used often by software engineers, editors, and users reviewing large amounts of text. The lengthwise orientation allows multiple pages to be read from the screen at any one time. Multi-screen setups, no matter how they are arranged, behave the same as if all the monitors were just a single screen. Mouse input moves from one monitor to another as if there was no difference between them. From the user’s perspective, there is no difference to how they interact at all. There is a scientific advantage to multi-monitor setups too. 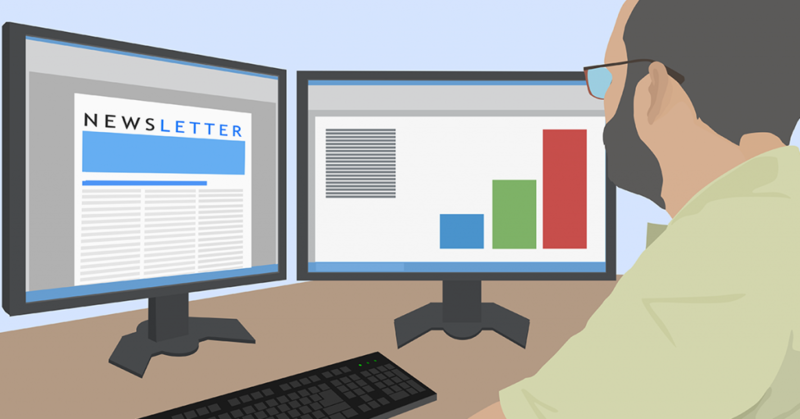 A survey by Jon Peddie research found that adding an extra monitor boosted a userâ€™s output by as much as 20 to 30 percent. A productivity advantage of even 10 percent is prized and very hard to come by in the business world. Receiving a productivity reward of over 20 percent for just the cost of adding a second monitor is something few firms can afford to pass up. The satisfaction of de-cluttering your digital desktop and keeping your focus in the zone is worth it alone. Give us a call at 570-779-4018 if you would like us to boost your setup by adding a second monitor.